If there's anything we all love more than making things with fiber, it's shopping for fibers, right?! Some of us are fortunate to have local needlework shops, while others don't have anything within driving distance. Forget the chain stores; they don't carry much at all. There's a wonderful world of threads, yarns, patterns, and teachers out there waiting to be seen in person (not just seen on your computer). 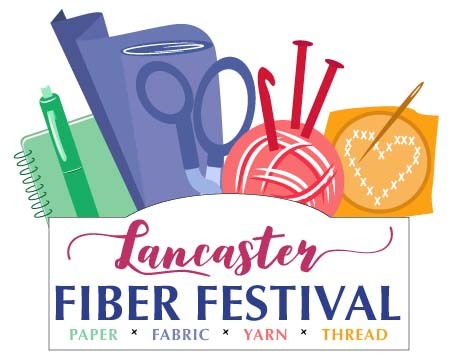 That's why events like the new Lancaster Fiber Festival are so much fun. Gather your crafty friends and make a summer road trip to Lancaster, Pennsylvania this August for the weekend show. Organizers are dedicated to creating a fiber love fest for all techniques: knitting, crochet, quilting, sewing, Zentangle, embroidery, cross stitch, Temari, mixed media, art, everything. (How many people out there do more than one technique? Many!) There will be a shopping area, classes, and demonstrations. Kreinik will be there doing fun demos too. This looks to be a fun event for all ages.